I am really excited for this evening’s post, because I have something new to introduce to the blog! I wanted to start a regular feature, and a feature that would allow me to invite some of my favourite bloggers onto ‘A Rosie Outlook’. I also wanted to think of something that was in keeping with the rest of my blog. So without further ado, I bring you…. As cheesy as it sounds, I like to think that I am a pretty positive person, and it was always my intention to use this blog for good things – having said that, I also think that Tuesdays are positively the worst day of the week (you’re not the beginning of the week, you’re not the middle, what are you trying to be Tuesday?) and we could all use a little happiness on a Tuesday. Without a doubt (as mentioned above) pop punk music is a sure winner to cheer me up when I am feeling down. My music taste hasn’t changed much since I was 15, which sounds pretty cringeworthy but to be honest it just makes me so happy! The nostalgia certain bands and songs give me is a feeling I will never get sick of. Luckily my boyfriend shares the exact same taste in music as me, so dragging him along to gigs is never a problem 🙂 A few of my favourite bands include Fall Out Boy, Paramore, Forever The Sickest Kids, Death Cab For Cutie, Dashboard Confessional, The Get Up Kids, The Early November, Biffy Clyro, A Day To Remember, and City and Colour. 4. What’s your happiest memory? Or a memory you think of that always makes you smile? A perfect day for me would be getting up early and heading over to the east coast for an early morning surf. Afternoon tea in a cafe by the beach (Cafe Irie in Cornwall is my most favourite place in the entire world, and my number one choice if I could be morphed from Edinburgh to Newquay in a jiffy) Assuming this morphing around the country could continue, I’d pop over to Carnaby street in London to find a nice outfit and some new makeup. I’d then jet back up to Glasgow for dinner with my girls at Sapporo Teppanyaki, followed by cocktails at Malmaison, and a night of dancing at the ABC. I’d have to top it off with a night in the awesome Citizen M hotel or even Blythswood Square if I was feeling REALLY extravagant. But yeah… that mega operation of whizzing around the country, and hopefully not running out of steam (or money, haha) sounds like a pretty awesome wee day to me. 6. One of the reasons I wanted to pick you for the first ‘Cheer up Tuesday’ is that you always come across on your blog as having such a positive attitude to life. How do you maintain that? 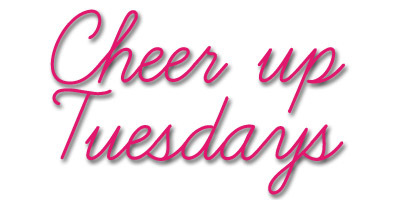 So there we have it – the first cheer up Tuesday of many I hope! Massive thanks to the gorgeous Ayden for being my first little interviewee!